In early 2019, another 1.5 vehicles by over a half-dozen automakers (see the list below) were added to the list of cars recalled because of defective Takata airbags. Automakers have added more than 1.7 million vehicles in the U.S. to the list of vehicles that should have their Takata airbag inflators replaced. The National Highway Traffic Safety Administration (NHTSA) and automakers are scheduling or spacing out the replacement of defective Takata airbag inflators based on the risk to drivers and passengers. According to the NHTSA, the Takata recall is the largest automotive recall in U.S. history, affecting 50 million airbag inflators in 37 million vehicles from 19 auto manufacturers. 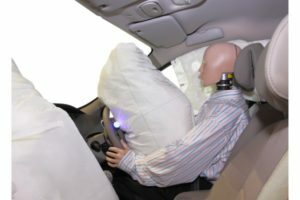 The NHTSA reports that, at least, 15 drivers and passengers in the U.S. have died and more than 250 people have been injured because of defective devices related to the inflation of the airbag. The defective driver- and passenger-side front airbag inflators are supposed to safely use ammonium nitrate to inflate the airbag when a vehicle crashes. However, the ammonium nitrate used by the Takata airbag inflators has the potential to become unstable over time, which may cause the inflators to unexpectedly explode with significant force. According to NHTSA data, a defective airbag that ruptures may disperse sharp metal fragments directly at the driver and passengers. Thus, in the event of a crash, the Takata airbags increase, rather than decrease, the risk of serious injury or death. The January recall includes vehicles from Audi, BMW, Mercedes-Benz, Subaru, Tesla, VW, and others. This recall follows the recent announcements from FCA (owner of Chrysler, Dodge, Fiat, Jeep, and Ram), Ford, Honda, Mazda, and Toyota that covered more than 3.5 million cars, trucks, and SUVs. The last wave of recalls is expected to be announced in early 2020. Customers may have the airbag inflators replaced at no charge. This policy applies to all automakers, who will provide notification to vehicle owners when dealers have the necessary parts to replace the defective inflators, most by the middle of 2019. Powell Law’s attorneys maintain a special vigilance for products that may be dangerous to all consumers. If you have any questions about filing a claim for damages caused by a defective product, contact Powell Law. Our decades of experience make it the clear choice to meet your legal needs for representation in personal injury and products liability matters in the Scranton/Wilkes-Barre area. If you or a loved one has suffered any type of injury resulting from the use of a product, contact Powell Law today at (570) 961-0777. The consultation is FREE and you don’t pay a fee unless we win.